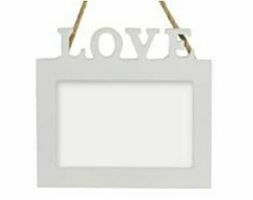 This beautiful white wood frame has thecut out letters "LOVE" at the top of it. It is a beautiful gift to a special someone, or as an engagement, anniversary or wedding present. It hangs with brown string and will look lovely in any room.